A few weeks ago, when Valerie and I had dinner at Open City, Val ordered the tofu scramble and pointed out that the restaurant’s addition of tahini to the scramble gives it a distinctly “feta” like flavor. Curious, I took a bite: I always did like feta, before I went vegan. Valerie was right: the scramble (which is really a cubed tofu dish, mixed with seasonings, but it’s reminiscent of a scramble) has a distinctly lemony, tart, and umami-rich flavor that is reminiscent of feta (or another tart cheese). For the last few days, I’ve been mulling over how I might create my own version of the recipe, and this quick and delicious tofu tahini scramble is what I came up with! The recipe marries two of my favorite plant proteins, chickpeas and tofu, and it makes for a very filling and nutritious component for any vegan breakfast. It’s great to serve to folks who are trying to eat more plant protein, and I’d say that it’s also a good start dish for tofu skeptics. 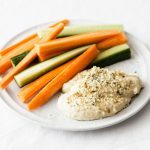 The flavors are really approachable (that is, if you dig hummus and tahini), and it’s just the right amount of savory. Feel free to modify with any vegetable add-ins of choice: I’ve now made the dish with spinach, onion, bell pepper, and zucchini. Consider this a template, just as much as a recipe. Heat the oil in a skillet or a large saucepan over medium high heat. Add the tofu. Cook for about 2 minutes per side, until each side is lightly browned (about 8 minutes total). Add the garlic and cook for 1 minute longer. Add the chickpeas, cherry tomatoes, tahini, hummus, tamari, and lemon to the pan. Sauté until the mixture is thoroughly warmed and soft. Serve. Scramble can be served alongside a whole grain or whole grain toast, or as an accompaniment to a big salad. Leftover scramble will keep in an airtight container in the fridge for up to 3 days. What a fantastically satisfying and savory meal! I’d love to hear what you all think. Even my mom—tofu shy as she is—was impressed. If you make additions — veggies, nuts, seeds, extra legumes, whatever–I’d love to hear about them. Finally, thanks for all the lovely commentary on yesterday’s post about restaurant dining after life with an ED. Such insight! Feta is one of my non-vegan favorites too – I wonder how they created that unique flavor! Your dish looks amazing, and I’m digging the super-high protein. It would definitely tide me over pretty well! I’m a recent tahini convert, already through my first jar, and this sounds delicious. Looks great! Just saw a recipe in “The art of living Food” for a Tahini Cheese. Loving the tahini/miso combination lately. Chickpea miso! BEAUTIFUL photos! This looks delicious! I have some tahini, just need to pick up the tofu. Thanks! Mmm, tahini, tofu, chickpeas, veggies, scrambled up in a stir fry that’s fast, one pan, easy…I am all about it! Looks delicious– tofu scramble in hummus form is definitely my kind of meal 🙂 I bet some cumin, smoked paprika and nutritional yeast would give the scramble more flavor and depth as well. My Baby Sister is going to DIE! Chickpeas, hummus and tofu are her favorite flavors ever. Thank you for this G! Wow I can’t wait to try this recipe out! It sounds just up my street, especially if it is reminiscent of feta. Thanks for sharing! really enjoyed your post yesterday but didn’t get a chance to comment. eating out is still an ordeal for me at this point in recovery. it was so nice to hear a positive but realistic perspective on what restaurant dinning can be for a recovered disordered eater. thanks! I would never peg tahini to impart a feta flavor, but I’ll take your word for it!! It looks delicious, and I used to love tofu scramble, but now it seems to bring back old hypoglycemia symptoms I used to have. Ever since giving up meat and cheese (I do have a tiny bit occasionally) my hypoglycemia went away. It feels so good not to shake and sweat whenever I go for a few hours without any food! But for some reason if I eat a bit of tofu the symptoms come back. Not sure why so sadly I have to stay away. After reading your post yesterday I am excited to try the salad at Josie’s you ordered. I never thought to just order it without the tofu and now it gives me another option when I go there. Gena, this may sound like a naive or dumb question but – it’s called scramble because everything is all mixed up and not – because it tastes like scrambled eggs. Right? I’ve never tried tofu and I’m trying to add more vegan meals to my life. I would love to try this but if it tastes like eggs I know I won’t like it. Please let me know. Thanks. Ha, this isn’t even a legit scramble, dear Johanna! My real tofu scrambles look like scrambled eggs (but thankfully, the resemblance stops there; they don’t taste egg like). So this is more a stir fry, called scramble only because it’s a little bit like my tofu scramble, which is not like eggs except in preparation/technique. That’s a complicated answer, but the upshot is: this does not taste like eggs. If it did, I sure wouldn’t be eating it. Thanks. I’m making a trip to the store and will try it this weekend. will let you know what I think. This looks wonderful. I’m always looking for new ways to dress up tofu. Re: feta – yes, this was one of my favs too. I have tried the soy feta, but never again. It is a pretty weak substitute. This would make a nice wrap or pita filling. It’s as if you read my mind! I’m not vegan, but was looking for a healthier alternative to the cheeses I love in my salads when I clicked on this in my Google reader this morning. Just made it for dinner and…AMAZING. I was surprised how much it resembled the tanginess of feta. Also, I used to be a big tofu eater then maybe I just ate too much of it because I suddenly could not stand the texture and was worried that this would be the case here. But this was perfect combined with the subtle crunchiness in the chick peas. And the flavors are just perfect together. I added a little sriracha on top too and it was great. ok, feta? i’m so down. re: protein cravings, when I first went vegan and was less organized about how I ate, I often had cravings for raw fish and sushi after work-outs. eventually i came to recognize that as “proteeiiiinnn! !” and started nourishing with nuts and beans, and it’s worked out. Lately, I find myself craving peanut butter (more specifically, a smoothie with banana, peanut butter, blueberries, and kale) at the end of a workout, so I guess I’ve changed my body’s mind about what “proteeiiinnnN! !” is. Just made a triple batch of this for the family – I added some home-grown zucchini and served it over kelp noodles. Ahhmazing! Thanks for the recipe. Gena – What kind of tofu did you use? Extra firm? New reader to your blog, and already truly inspired…I am not a vegan or even a vegetarian, but I am slowly weeding animal products out of my diet because I just FEEL better! Hope you don’t mind I read up and borrow some of these recipes to help me along my journey…huge fan of cheese, so your recipe above looks devine! can’t wait to try it! Hey Gena! So I know this is totally off topic, but I wanted to say it anyways. I have been reading your blog for a while, and I know that you have always been a fan of juicing. Especially veggie juice. I never really understood the fascination. That is until I tried it for myself. I used to suffer from IBS stuff just like you, and green juice has changed my life! It has totally turned my digestion around, and now I can’t imagine going a day without it! Thank you for the inspiration, and keep spreading the vegan love girl! Yum that scrabble looks fantastic! I need to try this immediately.. Sunday morning breakfast for sure!! I fall under the category of “anyone who’s super hungry” and “vegan who really and unabashedly loves tofu scrambles.” I think you made this one for me! I love this recipe! It’s super filling and great on top of whatever greens are in the fridge. I actually made it twice this week for my husband and me… it’s really that tasty, good, and satisfying. My husband didn’t even ask for dessert! Oh yow!!! Thanks, Gena!!! I made this tonight with the slight modification of adding chopped onion and julienne zucchini and carrots. It was delicious, served as lettuce wraps! My husband and son enjoyed the same recipe with chicken in place of the chick peas and tofu. LOVED this! And you’re right about the oddly feta-ness. Hi Gena! I previously made a post about this recipe, but wanted you to know after my husband and I finished eating Tofu Tahini Scramble tonight; my husband said, “you need to put stars by this recipe—I could eat it once a week!” Doesn’t that just thrill your soul! Did mine! We’ll, we’re going on a road trip which means eating breakfast, lunch, and dinner in the car. Guess what kind of salad I’ll be packing in the ice chest—Tofu Tahini Scramble! 🙂 Hmmmm even lunch in the car can be a meal looked forward to, taste wonderfully yummy, and be tons more appealing than any of the restaurants on the highway!!! I’m so thankful to have found you here at Choosing Raw! I recently had this dish at Open City. It was delicious! Thanks for recreating the recipe. Open City used broccoli and not tomatoes in my dish. Yes, that’s what I had there too! I adapted. So glad you like.